A relatively unknown Tesla safety feature called ‘Active Hood’, designed to reduce head injuries to pedestrians in the event of a frontal collision, was brought to light in a recent Model S owner’s video that attempts to capture Tesla’s Automatic Emergency Braking (AEB) in action. Active Hood which exists on European and Australian Model S vehicles uses pyrotechnics to raise the rear of the hood by several inches in order to soften the impact of a pedestrian and cyclist against a windshield during frontal impact. 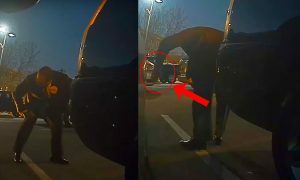 Model S owner and Tesla Motors Club forum member Carspotter Daily posted a video that attempts to simulate a vehicle-pedestrian interaction. The vehicle was a first generation Autopilot vehicle under Firmware 8.0. It’s unclear whether CarSpotter was intentionally trying to trigger Tesla’s Active Hood feature or whether they were looking to test the AEB system, but despite not being able to trigger either feature the end result revealed, once again, Autopilot’s ability to detect humans. 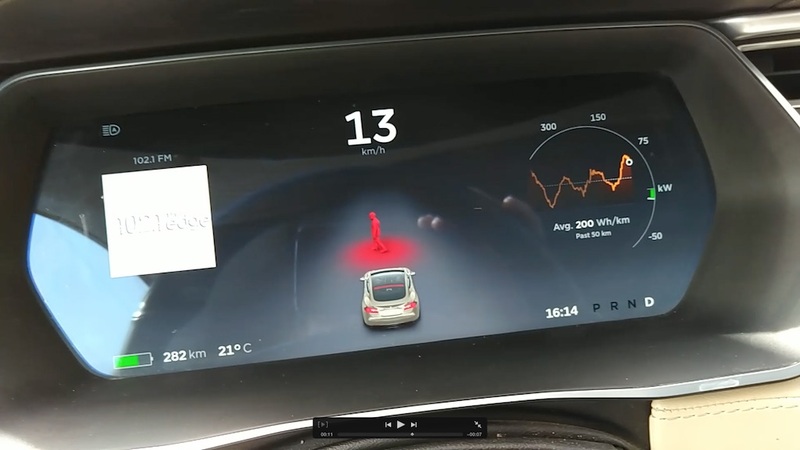 Another Tesla owner YouTuber KmanAuto first detected the pedestrian alert last November when he put a friend in front of of his moving Model S.
This type of granular detection of objects allows the vehicle to respond to potential collisions in the most appropriate way, with the objective to reduce collisions entirely. Though Active Hood was mentioned in the trailing notes at the end of the recent video, it’s not clear if the vehicle used in the video is a U.S. spec Model S or a European/Australian version that was included with that safety feature. 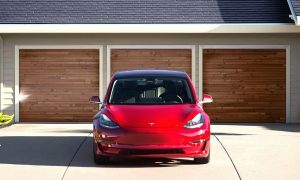 Active Hood is not a new feature but the fact that it has only been implemented on Tesla vehicles in select markets that mandate the technology has kept it largely under the radar. 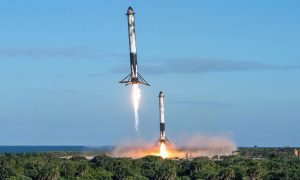 The technology was built into Tesla vehicles to comply with Euro NCAP Pedestrian Safety requirements that mandate vehicle manufacturers to maintain clearances between the hood and structural components underneath, to protect pedestrians in the event of a low to medium speed collision. These accidents often prove fatal to the pedestrian, as collisions at low to medium speeds typically cause the pedestrian’s body to fold over the hood with the head hitting the windshield. The system was put to use in real world conditions in Australia in 2015 when someone driving a Tesla Model S collided with a kangaroo which caused the system to deploy. From what they saw after the accident, it looked like the adolescent ‘roo had a broken leg but was conscious enough after the accident to limp away which seems to indicate that it was successful in preventing immediate head trauma. Tesla had a special challenge when designing Active Hood since the front trunk of a Model S is sealed to keep water out whereas hoods to internal combustion engine vehicles are generally vented. US Patent Application US20130076076 A1 details the specific challenges and solutions developed to allow the hood to pop up in response to an imminent collision with a pedestrian. Note: The pedestrian protection system relies on a series of sensors and algorithms to determine when Active Hood should deploy. Therefore, the system may not deploy in all collision or crash situations. If Active Hood has been deployed, the instrument panel displays an alert and an audible chime sounds. Immediately take Model S to the nearest Tesla Service Center. Active Hood’s associated sensors and actuators must be serviced by Tesla whenever Active Hood has been deployed. Warning: Deployment of Active Hood may cause the raised hood to partially obstruct driver vision. Driving a car with a deployed hood increases the risk of a collision. A car with a deployed hood should be immediately taken to the nearest Tesla Service Center. Warning: If the instrument panel displays an alert indicating that Active Hood has been deployed in situations where it has not, immediately drive Model S to the nearest Tesla Service Center. Note: If damage occurs to the front bumper, contact Tesla for a list of Tesla-approved body shops in your area. Tesla approves specific body shops to ensure they meet strict requirements for training, equipment, quality, and customer satisfaction. 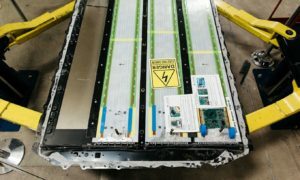 With Active Hood technology only existing on vehicles destined for the European and Australian markets, and Tesla being so aggressive about implementing safety features, the natural question is “why hasn’t Tesla made this a standard global safety feature?” An early Euro NCAP crash test video showed that Tesla began working hard at doing everything it can to avoid the accident in the first place. After all, avoiding a collision in the first place is far better for all parties involved than just mitigating what happens afterwards.